THE EU: In? Out? Shake it all about! I don't like how all the countries below the olive line are treated. I'm not sure I want to be part of a Union that will trigger crisis events for one of its members. I don't like the problems that the EU cartels cause for the developing world: we dumping cheap food on precarious communities which hampers their ability to build food networks of their own (and we have the cheek to expect better from China steel). I don't like thatAmerican corporate sharks are not just circling but seem to be closing in. I don't like that the EU will accept Turkey into the fold despite its horrendous record on humanrights when already we are being asked to share a table with Poland whose Catholic government seems to be sealing the fate on abortion rights in there. and France whose secularism is becoming increasingly more militarised. Then there is Germany with its links to the Central Banks which together work to grind down the fiscal prosperity of any member state that has no manufacturing capacity. I hate that the EU Commission is headed up by the ex leader of one of the largest Tax Havens in the world and which has managed to get Luxembourg excluded from the 2015 Tax Haven Blacklist - I wonder why? I don't like being asked to ignore all of the above as the price we have to pay for greater trade, growth and prosperity in the face of a 'precarious future', since I think that all of the above are corporate pre-requisites to keep us in a state of fear, instability and precariousness. In fact, the reality is that we are beginning to realise that it is not us, the commons, that experience growth and prosperity. It is 1% other people entirely. Such an argument is also water off a duck's back as I am also not pro-growth. The entire mechanism of the EU is regulated by the myth of endless growth. It should be clear for all to see that we've reached the point of 'peak most things'. Some of what we do have, cannot now be used because it would be detrimental to the health of the planet. I want an EU made up of countries that are prepared more to listen to Paris rather than the siren calls of proxy oil wars. I want an EU that will protect all its members - no matter what their past misjudgements have been - from misery and abject poverty. I want an EU that refuses to countenance all efforts of corporate America to inveigle itself into every corner of our civil society. I want an EU that is not in the pocket of the Central Banks. One which is prepared to curb the onward march of Capitalism and which will set up a social charter which is in the centre of its work and not, like everything else, just circling this chimera call "The Economy". I only think we can get this if we leave the current EU.For those who believe that we need to remain to ensure that our environment and our services are protected from the worst efforts of our horrendous Tory government my answer to you is that I honestly don't think it will, since TTIP will destroy protectionism of any kind - if not now, then later. Worst - it will be in place no matter what government we vote in. And this for me is the sovereignty issue. TTIP shows that Capitalism is a virus not yet quite spent and the current EU is ripe for the picking. No. In terms of our current situation, we should take responsibility for having put the Tories in power in the first place - for it happened on our watch - and ensure that we put in place a strong, progressive government that puts people first since this will be the only thing that will eventually ensure a strong, mixed economy that can withstand the sharks without and strengthen our communities within by building proper service infrastructures to cope with our increasing populations - including migrants. We are no longer reliant on old democratic forms. We have more control of the media than we ever have been. The political process is still corrupt but it has never been more transparent. It will do us no harm whatsoever to allow ourselves the confidence to take more control over decision making and to curb the worst efforts of our current Tory government to undermine our systems and erode our freedoms; to think small to start with, to get our house in order and then to model and start working to pick up the links with our European partners (which will never go away). If Brexit wins, there will be an horrendous interregnum led by Johnson probably. He'll no doubt try to lead the asset-stripping brigade, fully taking advantage of the fears so carefully seeded. If we let him. This man, embodying the complete triumph of form over content, will derail us for a while but through protest, constant activism, scrutiny and yes, even the withdrawal of labour, all such things come to an end. We really are not as powerless as we have been hitherto led to think. Our critical thinking has been diverted by false dichotomies (think shirkers and strivers); and manufactured moral panics (think migrants).Then we can be free to develop a more progressive way of life and only then, maybe, we can strengthen our alliances once again and help to build a much better - if different - EU....and if we remain? Well, all the above still applies. We'll just have to work harder within it. My last blog post was about corporate efforts to hide money and dodge tax. We all know about the Amazons and the Starbucks but there is another avoidance strategy which is about how goods - or more accurately, how the services related to goods are located around the world. Corporations brand, insure, distribute in house. By so doing they can then charge themselves for these services which they offer to themselves. Such 'charges' are made in offices located in 'high tax' countries which are then offset as costs. When set against profits in a 'low tax' location, such as Luxembourg, this cynical and creative accountancy is yet another means by which companies get to avoid paying their way. The only winner in this scenario is the corporation. Some only pay as little as 6% tax through this form of transfer pricing (or mispricing, given that companies can charge themselves what they like for their services to themselves). The original growers or manufacturers get a tiny fraction of the loot and any country with a respectable tax rate, including our own, loses revenue. The trillions lost through corporate robbery makes current austerity measures a joke. So if anyone asks you why you like to buy fair trade you can tell them you are putting money directly into the hands of countries and the communities therein, enabling a fair day's pay for a fair day's work. Fair traders in this country also pay their taxes and contribute to the social systems and infrastructure that we all benefit from. Small steps, perhaps, but ones well worth taking. If you want to see what fair trade can offer, why not visit the Radish Fair Trading Post? Britain: Treasure Island or an Animal Farm? My daughter is currently studying Animal Farm. This Orwellian fable seems so much a part of our lives that possibly we tend to take it for granted and be less aware than we should be of its messages. Certainly our own conversations about the novel have been confined largely to the themes and literary techniques within it; key players within the Russian Revolution, nature of leadership etc. However, it's ability to abide in our own present-day consciousness is not just because it offers us a history lesson in repetitive hegemony but because of the dangers it presents to us of a revolution led by a corruptible elite. We shouldn't let it escape us that though our country isn't in the grip of a brutal dictatorship, a 'Napoleonic' tour-de-force of terror, in some ways it's much worse than that. The brutality is covert and secret. The battlelines are drawn over the relationship between wealth and prosperity - and as we will see these can be mutually exclusive terms. Having attended a presentation by forensic account John Christenson I began reading Nicholas Shaxon's "Treasure Islands". Now here is a must-read for any lapsing neoliberalist. It tells the tale of how Britain has spidered itself to the centre of a web of financial shannanigins so complicated that it's doubtful whether many of our current politicians - chancellors included - really know what's going on. 23 tax havens have the Queen's Head on their flags all of which are hell-bent on secreting away the wealth that the rest of us have been farmed to create. Most of these havens are indeed islands. There is a good reason for this. Shaxon: The ability to sustain an establishment consensus and suppress troublemakers makes islands especially hospitable to offshore finance, reassuring international financiers that local establishments can be trusted not to allow democratic politics to interfere in the business of making money. This groupthink did not originate in the island havens - these are merely fortified nodes in bigger global power networks led by Britain and other large powers but they have come to host and protect concentrations of anti-government, kick-the-poor attitudes that originate elsewhere, and allow them to flourish unchecked. Christensen: The ruling classes realise they don't need to worry about the Democrats coming to power in the US, or Social Democrats coming to power in Germany, or Labour coming to power in Britain. They realised they didn't need to fight the fight at home. They already had this flotsam and jetsam of the empire strewn across the globe, with their red post boxes and British ways of life and incredible subservience to the English ruling class. Happy days. The city gentlemen had found a way around the threat of democracy. Shaxon tells us that our determination to deregulate, and allow all manner of corporations and criminals (not necessarily the same thing) to move money out of the building makes us, essentially, one of the largest tax havens in the world. It goes beyond islands. It's like when those (mythical?) explorers went to look for the largest meteor crater in the world and discovered they couldn't see it because they were actually in it. Well, today the politicians talk about tax havens, and concomitant evasions as if they're something that's happening apart from us. In fact they're happening because of us - we're 'it'! The Treasury's attempts to dig us out of the crater of debt is laughably delusional. Not only does it not acknowledge our continuing collusion in letting trillions gush in and then out of our offshore jurisdictions, it seems to stands agape wondering why the sums don't add up. But it knows. It really does know. But this financial system is essentially ectopic - it at once uses the establishment to run outside of the establishment which is why politicians and treasuries cannot penetrate the web. Secrecy is the glue that weaves and holds the silk. It requires real courage and global co-operation to deal. Any party that is supportive of politicians who sit on company boards (and some sit on many company boards) is powerless to do anything other than maintain the status quo - as indeed reform in any form would work counter to their own personal interests. Europe is making strides to shut down some of these loopholes - no wonder elements of the Tory Party want to get out. Where would they put their money? And further: since the crash of 2008 -which was born largely of the same forces of greed and acquisition - they still collude in the same lie that we're all in it together and that the poor should take its share. Well, why? Why on earth should the poor and the innocent pay anything? Why should we have to tolerate cuts and austerity and benefit losses when trillions are routinely being stashed away? The pigs got away with it because they ensured the rest of the animals were kept too busy and too impoverished and too ill-educated and too frightened to ask the right questions and take even the most basic control over their lives. Even those who knew what was going on were too cynical or too vain and self-interested to take action. Orwell is as relevant as he's ever been and thank goodness that today there are still some minds prepared to #Occupy themselves with the issues, often doing nothing more than just sitting in front of a bank or a Starbucks and refusing point blank to be taken to the knackers yard. 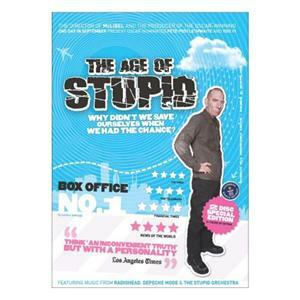 The Age of Stupid gone Starkers!!! I was going to start this post by saying I can't stand David Starkey but actually that would be untrue. I think he's wrong-headed, arrogant and grossly over-opinionated. I also believe life has dealt its blows and left him unable to keep the personal out of his occasional 'out of his box' appearances on Question Time or in the painful Jamie's Dream School. Now that I've covered my back - not wanting to seem too much like a Starkey apologist - I was nevertheless very taken with what he had to say in his recent series The Churchills. I really enjoyed this because Starkey articulated a link between layers of historical narrative: John Churchill's (the Duke of Marlborough) crucial strategic interventions in the 17th Century 'world war' against Louis XIV and how, through his own biography of his ancestor, Winston Churchill was then able to spot a despot when he saw one in Hitler. One comment Starkey made spoke to our very current situation though. He has this overriding contempt for the intellectual capacity our current stable of politicians. He curled his lip and sneered that none of them would be capable of creating the volumes of work put out by the latterday Churchill. He's right. Our 'leaders' operate in an intellectual vacuum of olympian proportions. Those that have produced a tome, have eschewed the work of research in favour of autobiographies; self publications either to cash in on some imagined fandom or to embark upon puny rationalisations of warmongering or failed economic policy. Oh yes, or indulged in Hollyoakian Westminster gossip. However it is presented, this conundrum has been systematically ignored by the Powers That Be. The neoliberalism espoused by our three main political parties make it an impossible puzzle for them. Resolution requires introducing and managing limits that is entirely counter to the neoliberalist position. The social and economic implications of the sheer scale of what needs to be done demands an intellectual magnitude which eludes the current lot. It seems to have further escaped them that a societal paradigm change is in process. The web has allowed the development of deeply-rooted, global social and political networks that are naturally undermining the old hegemonies. Those who belong to such groups are astounded at the scale of denial and ignorance from those who are meant to lead us. Only today my twitter feed had Caroline Lucas writing about many of the ideas put forward by contemporary heavyweight thinkers fully grasping the battle ahead. She repeats the endless frustration with a government some blogger once described as behaving no better than the string quartet on the deck of the Titanic. Unsurprisingly, however, big business has seen the writing on the wall. Featured in many debates about the manipulation of global food economics and worries over its workplace practices, Walmart, is a case in point. They aim for zero waste by 2020, have taken thousands of lorries off the road thereby saving tons of C02 emissions. This has been achieved through forcing manufacturers of various ilks to deal more in concentrates thereby reducing the size of their packaging. Their recycling vision is also a stunner, hoping to be entirely energy independent by 2030. Tesco has long ago taken much of its logistics to the train, cleverly labelling their carriages Less CO2 Rail. (Lesco - geddit?) The lesson to be learned here is twofold: that business leaders have no problem whatsoever interpreting the future and acting on it now, but also that this proclivity is writing on the wall for large corporations to continue their stranglehold on food economies as they become leaner and fitter survivors in the future low carbon age. Can this be said of populations, cultures and countries whose leaders are in the thrall of Stupid? As we know social and political networks are espousing different leadership models. Some will work and some will not, nevertheless the issue of 'leadership' per se is working itself into political discourses at many levels . Why? Because, as Starkey says, we're 'groping'. Our current leaders are failing to see the challenge ahead of them. Much like successive governments in the 1920s and 30s which didn't spot a despot in time, the west continues to spew out second-raters who can't get a grip on a blasted future that is hurtling towards us. There can be no appeasement. It didn't work then and it won't work now. That is the Stark naked truth. Marlborough: His Life and Times by Winston Churchill. Currently unavailable except by special order. Please email me at meg@radishweb.co.uk for details. Citizen's Income and Green Economics by Clive Lord (This book uses as its core metaphor the ravaging of Easter Island. A culture that just couldn't stop until it had no resources left).